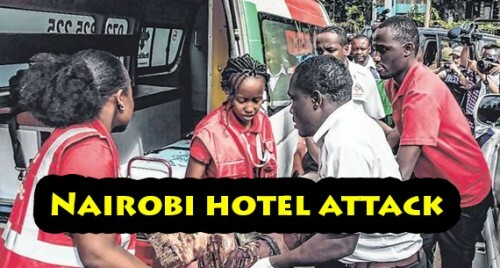 Nairobi, Jan 17 (IANS) The death toll in Tuesday's attack on a luxury hotel complex in the Kenyan capital of Nairobi has increased to 21, police have confirmed. "We wish to inform that six other bodies were found at the scene and one police officer succumbed to his injuries," Inspector General of Police Joseph Boinnet told the media late Wednesday. Twenty-eight people were admitted to hospitals and "five terrorists were eliminated", Efe news quoted Boinnet as saying. The victims comprise 16 Kenyans, one Briton, one American, and three people of African descent who have not yet been identified, said Boinnet. "We have arrested two individuals who we have very strong reasons to believe facilitated the attack and are in our custody assisting the police with their investigations," he said. The Kenyan Red Cross said in a statement late Wednesday that their psychosocial teams had reached 341 people with more expected to receive counselling through a hotline and at Chiromo mortuary. Earlier Wednesday, Kenyan President Uhuru Kenyatta declared the police operation at the 14 Riverside complex over, with all terrorists "eliminated". The Somali jihadi group al-Shabaab, which joined Al Qaeda's international network in 2012, claimed responsibility for the attack in a broadcast on its radio station Andalus. Nairobi had not seen any such attack since September 2013, when in an operation similar to Tuesday's, at least four al-Shabaab terrorists stormed the Westgate Mall not far from the 14 Riverside complex that is frequented by foreigners and Kenyans. The worst terrorist attack in Kenya was the 1998 bombing at the US embassy in Nairobi which left more than 200 dead and thousands wounded.